Our field requires an extremely skilled workforce. Our professionals must be knowledgeable and well-trained. They must be dedicated and compassionate. This combination is critical to a successful medical outcome for our patients. Recruitment of the right individuals – who together become a dynamic healthcare team – is important to our organization’s reputation. The ability of any healthcare system or medical practice to become a vital and respected community partner is intrinsically linked to its ability to build a workforce that shares its values and commitment to community. Why does Carondelet Health Network invest in and support economic development initiatives? The most successful and stable economies in our country appear to be those in which major businesses help one another. The community’s overall economic strength lies in its business leaders sharing ideas, supporting one another’s growth, encouraging expansion by other potential employers, providing support and incentives for small business development, and working together to better the future outlook for all residents. Regarding the TREO Blueprint Update, why is the committee you serve on in this strategic planning initiative important to you? As a Healthcare Committee member, I am encouraged by the incredible enthusiasm of the members of our group toward strengthening the well-being of this community. Carondelet made a commitment more than a year ago to move away from a focus on reactive medical care and toward a model that provides Tucsonans with avenues to proactively manage their health. We are committed to keeping the healthy well, working with at-risk patients to mitigate problems before they develop into chronic illnesses, and managing the chronically ill so they can live their very best lives. I see an interest among all members of our committee to make Tucson a healthier place to live and to build a reputation as one of the healthiest places in America. What is the outlook for your industry in 2014? 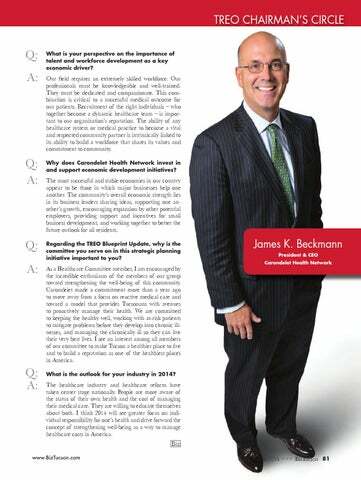 The healthcare industry and healthcare reform have taken center stage nationally. People are more aware of the status of their own health and the cost of managing their medical care. They are willing to educate themselves about both. I think 2014 will see greater focus on individual responsibility for one’s health and drive forward the concept of strengthening well-being as a way to manage healthcare costs in America.